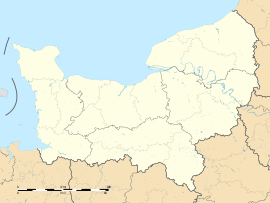 Oissel is a commune in the Seine-Maritime department in the Normandy region in northern France. A suburban and light industrial town situated by the banks of the river Seine, just 8 miles (13 km) south of Rouen at the junction of the D18 and the D13 roads. Junction 22 of the A13 autoroute is entirely within the commune’s borders. SNCF operates a TER rail service here. Per pale argent and azure, a half-filled alembic gules and a garb Or, and on a chief gules, a leopard Or, armed and langued azure. Daniel Horlaville, footballer born in 1945. Raoul Grimoin-Sanson (1860–1941), cinematographic inventor. Grégory Tafforeau, footballer born in 1976. The church of St.Martin, dating from the nineteenth century. The sixteenth century manorhouse, the Manoir de La Chapelle. The Dambray Pavillon, from the seventeenth century. The Château de La Perreuse. Wikimedia Commons has media related to Oissel. Pictures of Oissel, the photoblog of an osselien. This page was last edited on 21 May 2018, at 21:03 (UTC).